A new method for computer-generating random numbers is being called "remarkable", and could help improve computer security. Random numbers are important for computer encryption, lotteries, scientific modelling, and gambling. Current methods of generating random numbers can produce predictable results. Researchers said the new method could generate higher-quality random numbers with less computer processing. The problem of generating random numbers lies in the fact that computers are fundamentally predictable machines, running calculations and delivering answers based on mathematics. The new method was detailed in a paper by two researchers from the University of Texas - Prof David Zuckerman and Eshan Chattopadhyay - and was first published online in July 2015. It has taken almost a year for other researchers to examine the study's findings, expand upon the method, and for the original authors to add revisions. There are currently two main methods for generating random numbers. In the first, a computer picks numbers according to an algorithm or from a pre-generated list. This method, while fast and not requiring much computer power, is not truly random, because the results are predictable. The second method introduces an unpredictable element from the real world into the algorithm. This might be a reading of air temperature, a measurement of background radiation, or variations in atmospheric noise. Some of these measurements, however, have their own patterns - and may not be truly random. They can also be difficult to acquire. The new solution takes two "weak" random sources to generate a single, high-quality random number. That made it a faster, more practical solution for an almost-perfectly random number, said Prof Alan Woodward, of Surrey University, and it could have implications for encryption and security. "In cryptography, random numbers are essential," he said. "Given enough time, all algorithms can be reverse-engineered. "You have to build the algorithm so that it takes so long to reverse-engineer it's not worth it. "Random number equations are central to injecting this randomness." "It's not often that cryptographers and mathematicians get excited... but it does look like party time. Dr Mads Haahr of Trinity College Dublin - who created the online random number generator random.org - said the development was an improvement in efficiency, but did not mean there would necessarily be a fundamental leap forward in the way encryption or computer simulations are done. "While the paper might be an excellent contribution in the specific research area of randomness extraction, I would not necessarily see it as a huge breakthrough in practical applications... all those things are already possible with existing methods and have been for many years," he said. "If the authors' claims hold up, we will be able to do these things faster than before, and with equipment of poorer quality, which is great, but the method doesn't enable any applications that weren't possible before. "I'm glad to see there is good research going on to improve the state of the art. 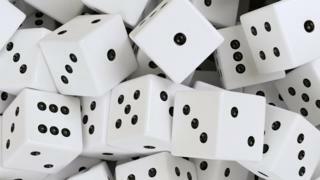 "In many ways, randomness is the under-appreciated cornerstone of data security. "As regular users of information technology, we tend not to appreciate how important it is." The team behind the study will now present its research at the annual Symposium on Theory of Computing in June, where it will be one of three recipients of the best paper award.